Removing the dashboard trim in front of the MyGig unit is unique for each vehicle. The trim piece is released with a plastic pry tool or your finger-tips, but it may help to have an illustration of the physical boundary of the piece being removed. If you do a Google search you will find YouTube videos and Web Sites to show you how to pull the MyGig trim for your car. 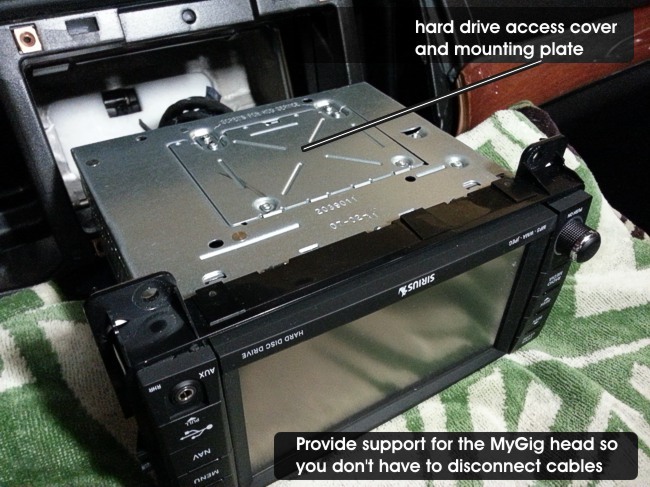 Important Before you pull the MyGig unit from your dash, improvise temporary support just below the MyGig opening in the dashboard. You can then leave all the cables connected to the MyGig unit when you pull it out. This saves a lot of time, avoids breaking something and allows for testing before you reinstall your Mygig system. On the Jeep below it only takes a couple of big folded beach towels. On your car it may take more effort to get the height, but this prep item will still save time and reduce risk. Car Battery Disconnected Unless you can find and remove the correct fuse(s) The MyGig system is always powered . . . even when the ignition is OFF. Your car battery must be disconnected when you connect or disconnect the Hard Drive from the ribbon cable. The unit below is pictured upside-down. Removing the hard drive on this unit requires an 08T Torx bit. By leaving all the cables connected, you can reconnect the battery and test the unit while it is still upside-down. Just remember to disconnect the battery if you remove the hard drive again for some reason. Be careful when handling the hard drive. The drive can be damaged with rough handling or by dropping it small distance to a hard surface. First, remove the hard drive access cover from the MyGig unit. Next remove the drive from the cover to get better access to the ribbon connector. The connector might be very tight. Don't pull on the ribbon cable or the connector - Carefully release from underneath with a sharp pointed knife a little at each end a couple of times. Unlike most hard drive connectors this one is not keyed, so its possible to plug the hard drive in up-side-down, or to be offset left or right one row of pins. Just remember the bottom of the drive is facing up as shown when you plug in the ribbon connector and verify the alignment of the connector to the pins. 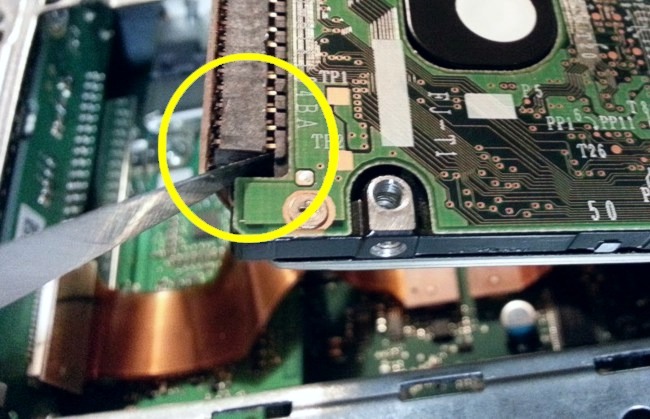 Plugging your hard drive in incorrectly can destroy the drive.